Recorded in the spellings of Green and Greene, this is one of the most widespread of English, and sometimes Irish, surnames. 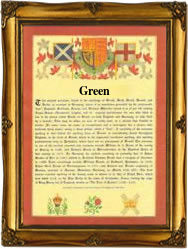 It is usually of pre 7th century origins, and derives from the word "grene" meaning green. As such it may be topographical for a person resident by a village green or even a place called Green, or as a status name for a young man who played the part of the mystic and fertile "Green Man" sometimes known as "Jack in the Green", in the May Day fertility celebrations. In this context "green" was symbolic of youthful ardour, spring, and the re-growth of nature. Sometimes the surname can be of Irish origins, and a translation of the ancient Gaelic given name "Uaithne". As this also means "green," it probably has the same basic meaning and origin as the English form. Examples of the early recordings taken from authentic rolls, registers and charters of the Middle Ages, include Richard de la Grene of the county of Norfolk in the year 1200; William Grene in the Hundred Rolls of Yorkshire in 1230; Robert Othegreen, and Henry on the Green, both of Worcestershire, in 1274. Among the many distinguished namebearers listed in the "Dictionary of National Biography" are Charles Green (1785 - 1870), an early aeronaut, who made the first ascent with a hydrogen gas balloon in 1821. The first recorded spelling of the family name is shown to be that of Geoffrey de Grene. This was dated 1188, in the "Pipe Rolls" of the county of Kent", during the reign of King Henry 11 of England. He was known as "The Builder of Churches". 1154 - 1189. Surnames became necessary when governments introduced personal taxation. In England this was sometimes known as the Poll Tax. Throughout the centuries, surnames in every country have continued to "develop" often leading to astonishing variants of the original spelling.